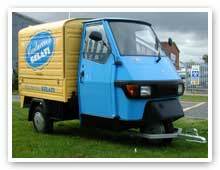 The Piaggio Ape is perfect for all your business needs as it can be converted to your own specifications and requirements. 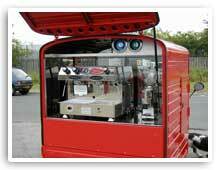 Low running and maintenance costs teamed with great fuel consumption rates make the Ape the ideal choice. 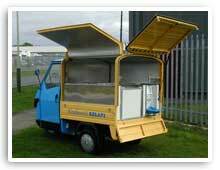 Catering modifications, from soup and coffee, to fast food and curry vending! 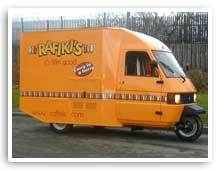 Mobile advertising unit, perfect for maximum standout on the street! The quirkiness of the Ape ensures attention grabbing appeal, whilst as an advertising medium it is both flexible and cost effective.